Mary, Queen of the World Cathedral has been modeled on the lines of Saint Peter's Basilica in the Vatican, but smaller in scale and grandeur. Mary, Queen of the World Cathedral has been modeled on the lines of Saint Peter's Basilica in the Vatican, but smaller in scale and grandeur. 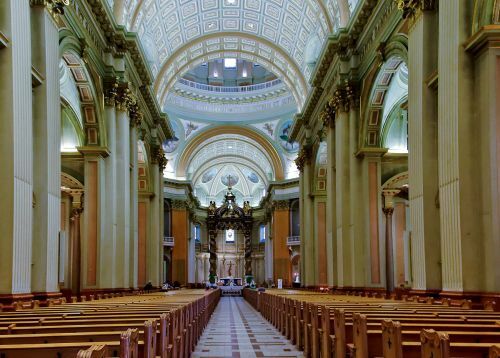 Built at the end of the 19th century, the front of the cathedral is topped by statues of the patron saints of 13 parishes of Montreal who donated them, including St. John the Baptist and St. Patrick. A neo-baroque gilded red copper baldachin overlooks the altar. In the nave and transept, paintings by Georges Delfosse illustrate the historic beginnings of Montréal which was known as Villa Marie at the time.